← WIAW~On The Road…You Don’t Want To Know! So far most of our time since our arrival in New Mexico had involved drinking water and napping. The road trip itself, the time change and I think the altitude were all responsible for the napping. I drink a lot of water on a regular basis, but here because of the dryness, more water is definitely necessary. Glad I brought my big Weight Watchers 32 ounce mug with me. Fill it up and drink it down. I keep it with me and I’m ok. I think I filled it up three times and drank it down three times on Wednesday. I almost said Monday, my days are still a bit confused, Ralph’s, too. We decided though that we needed to get into town to see how the old place has been doing without us. Our first stop was at probably our favorite place, Java The Hut. It’s a wonderful tiny, sort of indoor outdoor coffee shop. It’s not fancy, but it has a wonderful atmosphere and we try to go there as often as possible while we’re here. The coffee is excellent. Our friend, Marcia, the owner told us that she went through a lot of coffee blends to come up with just the right one. It’s rich and strong but not bitter. We fell in love with Marcia the first time we met her and have remained friends. I didn’t take any photos of the shop but you’ll see it soon. We decided we needed lunch before coffee. Ralph had a sandwich from Java, ham salad which he declared “excellent.” I opted to get mine at Diane’s Bakery and Deli, just a few steps away and also a part of The Hub. The Hub is a great little complex of eateries here in Silver City. Diane’s has lots of sandwich options, all on fresh made rolls. I’ve had their veggie before and wanted it again. You get lettuce, tomatoes, onions, banana peppers, mayo, mustard, oil and vinegar. You also get your choice of 2 cheeses and are they interesting and delicious. I had horseradish cheddar and pepper jack/colby. It was so good. My roll was whole wheat. It also came with a pickle and a cookie! I gave both of those to Ralph. I’m Trying To Be Good. You all heard me say that. We just sat outside of Java The Hut in the little terrace area. We got to meet a man who Marcia referred to as “the character of the day.” Believe me, Silver City is full of them and they all seem to gravitate to Java The Hut. It’s the place to be! I don’t want to bore you all with my speeches about the beauty of New Mexico. How many words can I replace with this picture? 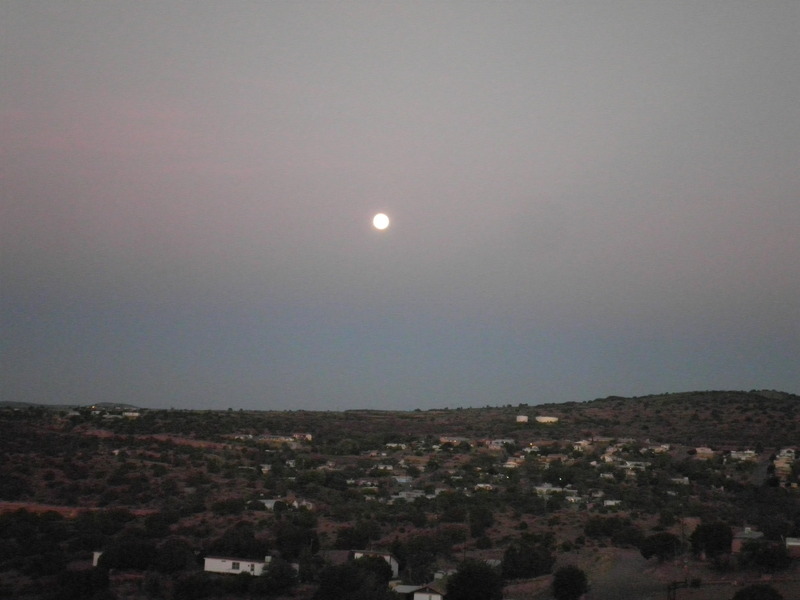 Full moon at sunrise over the valley. ‘Nuff Said. Happy Thursday! (Had to think before I typed that!) That’s all for the moment from the Land of Enchantment! This entry was posted in Uncategorized and tagged coffee, Enchanted Days, Urbanspoon. Bookmark the permalink. Stay hydrated. I spent two weeks in Phoenix last nummer feeling like I was hungover. I might be visiting a friend in Las Cruces next year. I love that part of the country. Hey Russel! I actually forgot how dried out I can become. I keep my mug with me all day long! We came through Las Cruces on our way here. Haven’t spent any time there, but I would love to see the city. We just passed though ourselves, but the Elks there welcomed us like long lost family. One has become a good friend. You’re a lot closer than me now 😉 Enjoy the desert. I wish I was there right now. I’m growing gills with the 90+% humidity. It’s gorgeous here. Even in the 90’s. Haven’t heard what the humidity is. Our house here has no air conditioning, but we’re on the top of a hill…all we have to do is open all the windows and we get wonderful breezes. This is my happy place! That’s totally my family too, eating at a few different places. I was at the mall with my sister and the kids doing some school shopping and we went to the food court for lunch. I got Ethan pizza at one place, a drink at another (because who can resist bright green limeade), Lila’s meal at another, and of course mine at still another. 4 different places for 3 people. Makes perfect sense right? Marie, I would definitely be with Ethan on the limeade! This is so funny and I can just see you doing it! Sounds like fun, though. I think that’s what food courts are for! Java the hut??! That is THE BEST coffee shop name ever!!! I can’t wait to see a photo!! I understand how your days are all mixed up, fran! Vacations do that to me, too! Thanks, Cathy! Java is nothing fancy and their are fancier shops in town, but this has such character and is filled with characters, Ralph and I can’t bring ourselves to eve Try the other places. Meet us there! Glad you are so relaxed you almost forgot what day it was! Gorgeous photo! Thanks, Stacie. It is just so beautiful here, people will start getting tired of the sky photos. Ralph and I just sit and look, almost stupified! Java the hut??? That’s hilarious!!! Glad all is well in New Mexico Fran. Roz, it is a great little place and the best coffee around! Take care. It’s so funny, and I don’t know why, but you Still end up in my spam file. Glad I keep checking it because I wouldn’t want to miss your comments! That photo is beautiful…and you’ve described Java so vividly that I can’t wait to see a picture of it. Zo, over the years being on WW I’ve gotten so used to drinking water and I’ve gotten Ralph on the wagon too. But here, it’s amazing how much you need to drink. I have to keep reminding Ralph to drink. It’s worth it though!